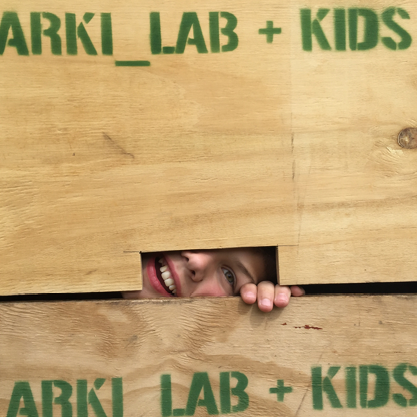 Last week, arki_lab got our hands dirty and built around 20 of the boxes that the children at Vesterbro Ungdomsgård have designed in the collaborative process we have been working on. The Easter Festival that they put on offered a great chance to see how these multi-purpose objects could be used. Turning ideas and thoughts into concrete objects on a 1:1, life-size scale, is perhaps the most important stage in the design process. Even the best designers cannot perfectly envision how a sketch or diagram will work and interact with the space, so this method of prototyping represents the first, significant opportunity for reflection on the strengths and the limitations of a design, and therefore it is a great chance for thinking of further improvements. Creating full prototypes of a design allows us to both feel the effect of the objects in and on the space, and also feel the objects themselves, engaging many more of the senses than a drawing possibly can. By playing on the boxes, moving them around and using them for different activities, our bodies are constantly collecting and processing stimuli, from the relation of space to fine details such as texture. If we are to make the most of the power of the prototype, feeding it into adjustments in the design, we need to find ways to access this information gathered from the users. We can make observations, taking notes and photos of how people interact with the boxes. We can ask the users questions about how they feel about the objects, what they have used them for and what would they like to be able to do instead. Another approach is enable the users to generate their own data, using tools such as our CoCity App to document their ideas. Despite our methods and tools, evaluating the effect of prototypes is not yet a perfect science. While asking people about what they think or getting them to take photos of their use of an object can be the source of some data, it is difficult to accurately capture responses, much of may be lodged in the subconscious or the product of complex neurological reactions that are, for the moment, not feasible to monitor on a large scale. Nevertheless, we believe that user-driven design represents the best way to build city spaces, and that by allowing the people who will use the final product to directly influence the process, the possibilities for producing a space that works for and with the people are maximised. Making a 1:1 temporary version offers the most simple, cheap and effective way to assess whether we are going in the right direction. At arki_lab we continue to reflect on our methods and tools, trying to find the best way to engage people in the design of their urban landscape. Our tools, such as the previously mentioned CoCity App but also our site-based ‘board game’ arki_nopoly, play a big part in this process, but in the upcoming months we will be refining them and seeing how they can be improved.